This popular Indian street food is so easy to make in an instant pot! And thanks to my pre-made onion masala, this one pot dish is literally a dump and cook type of recipe! 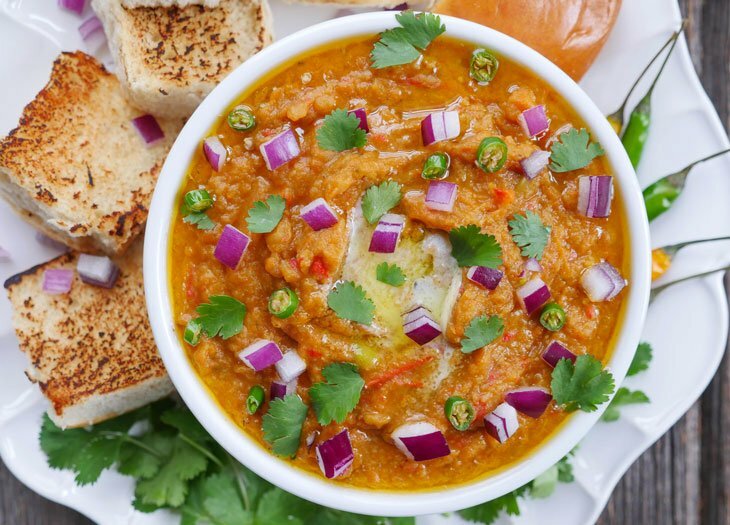 Pav bhaji is a popular Indian street food dish originally from Mumbai. If you’ve never heard of this dish – “pav” just means buttered bread and “bhaji” is a thick mashed vegetable curry/sauce. 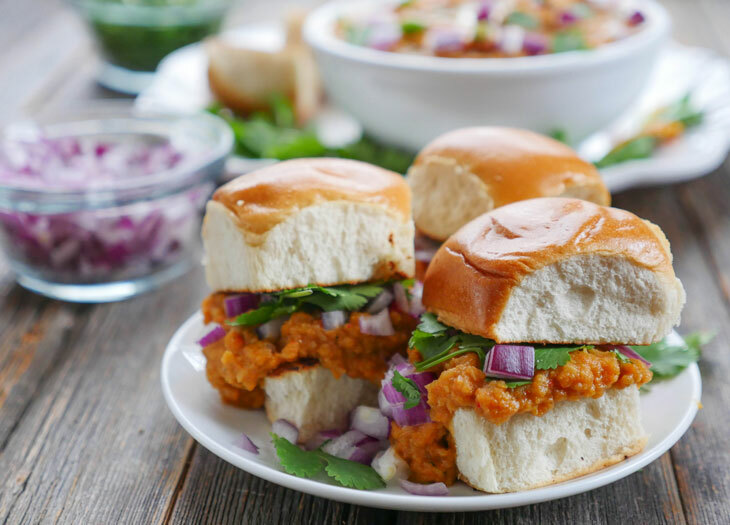 Think of pav bhaji as an Indian vegetarian sloppy joe! It doesn’t actually taste anything like a sloppy joe, but it’s messy and fun to eat! You can put it on a bun and top it with chopped onions, cilantro and green chilies! A perfect and fun warm veggie sandwich. Comfort food at it’s best! Having my Pre-made Onion Masala Makes this a Dump and Cook Recipe! The great thing about this dish is that it’s SO simple to make, especially if you have my pre-made onion masala handy. You literally put ALL of the ingredients in a pot and cook. That’s it! 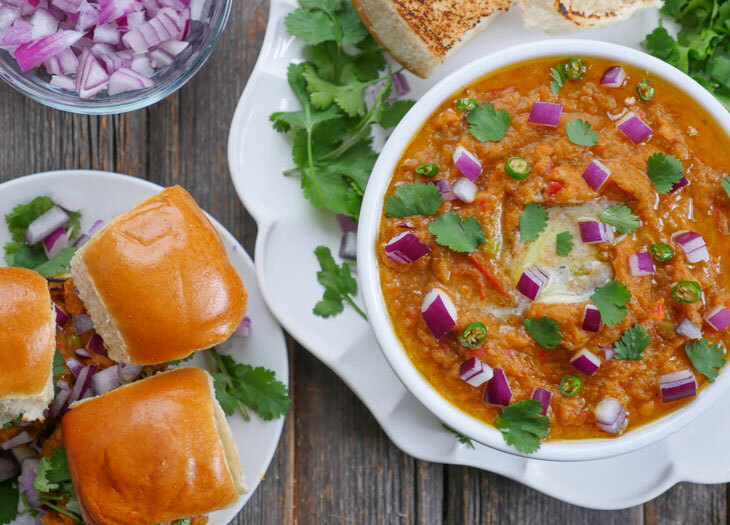 This recipe for pav bhaji is part of my onion masala series called: Onion Masala LOVE. My goal with this series is: to show you how easy it is to prepare Indian food on a daily basis. You can use any buttered roll to go along with this bhaji. Just be sure to melt some butter in a pan and toast the bread a bit – the texture of the soft yet toasty bread with it’s crispy edges is such a nice contrast to the veggie curry. Roby (my hubby) loves eating pav bhaji with sweet Hawaiian rolls (I get them for him from Trader Joes’s). I like them with either gluten-free hamburger buns (also from TJs) or with schar gluten free buns (I get those from Giant Eagle). I can’t wait to hear what you think of this recipe! 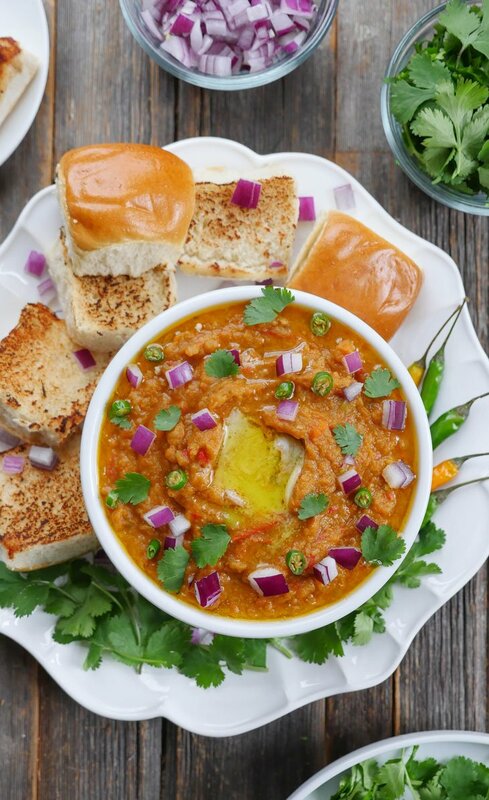 You’re going to love how it tastes and how easy it is to make with the onion masala! Add all of the ingredients except for those listed under “add later” to the pot. Secure the lid, close the pressure valve and cook at high pressure for 6 minutes. Use a potato masher or a wooden spoon to mash the vegetables. You can add some water at this point if needed to adjust the bhaji to desired consistency. Stir the butter and lemon juice into the pot. Serve with Pav (buttered rolls) and garnish with chopped cilantro, red onion and green chilis (optional). You can also top the bhaji with extra butter! 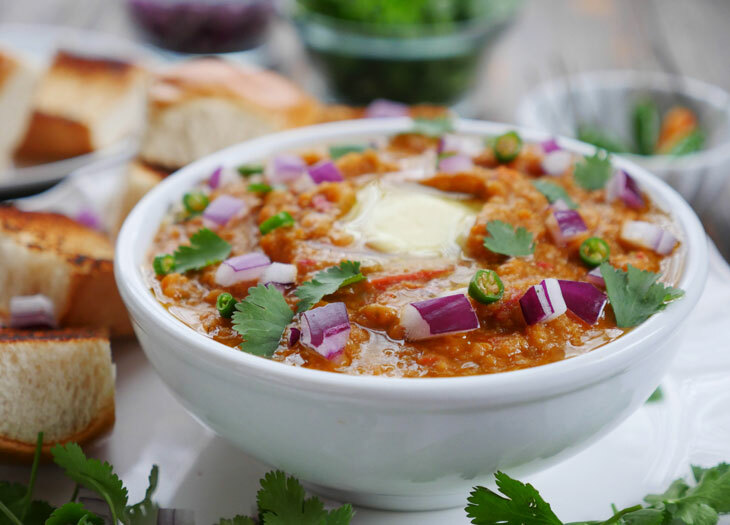 You can use a pre-made pav bhaji spice blend if you prefer – I just like to list spices out to ensure consistent results as spice blends can vary and can sometimes include unnecessary/odd ingredients. Sometimes veggies can be different sizes and so if you feel the bhaji needs more onion masala you can always stir it in at the end if needed. Since the onion masala is already cooked, you can always add more! Thanks for the great recipe, Ashley! Made it last night and it was so easy and delicious, just like all of your recipes! Just one quick question: if I want to replace the spice blend with pre-made pav bhaji masala, how much of the pre-made masala should I use? Thanks Deepti!! I haven’t tried it with pre-made masala but I’ve heard from others that around 2tbs works 🙂 Let me know how it goes! Hi Ashley, I want to try out this recipe but I do not have onion masala pre-made. Any easy alternatives? I have made it with 2 TBSP of the premade Masala spice blend and it was so hot it was barely edible, and we like spicy! I would suggest starting with 2 tsp.